a. Use the Fire Wand instead of the usual dagger. b. Trace the Invoking Pentagram of Fire instead of the usual Banishing Pentagram of Earth. STEP TWELVE. Replace the now charged and consecrated Fire Wand in its appropriate place on the altar. Finish by performing the Closing by Watchtower. Use a piece of red or white cotton or silk to cover the Fire Wand. When you have finished performing these rites to your satisfaction (we are harder judges of ourselves than we are of others) you will no longer be a beginner or neophyte in the world of magick. Very few have started down the path leading to a magickal way of life. Fewer go past the first few faltering steps. It is a miniscule number, indeed, who can claim to be true masters of the magickal art. No, you are by no means a master of Ceremonial Magick even if you have really practiced and learned from these first six lessons. But from my experience, if you have practiced and learned, you probably are more knowledgeable and magickally adept than 75%-95% of those calling themselves magicians. This is true even though you have not as yet done any real practical or Grey Magick. It is not well-known, but there were really two "inner" Orders in the Golden Dawn. No members of the Outer Order were supposed to know about either of these inner Orders or their workings. 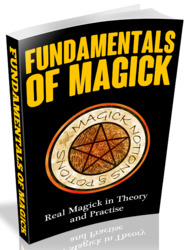 One of these Inner Orders only had one degree and taught no magick. It was where people who were judged to have no magickal skills were placed. Even they were not aware of the full meaning of the Magickal Inner Order, the R.R. et A.C. The name is a Latin abbreviation for "Red Rose and Gold Cross." To get into the R.R. & A.C. you needed to be invited. Once invited it was your task to make and consecrate your Magickal Tools. Entry into a grade of a magickal Order was done by initiation, meaning to start. A person did not have the full abilities of a degree when he or she entered that degree, only (theoretically) when it was left or completed. Therefore, for all practical purposes, if you have done the work, done the study and understand what you are doing, for all reasonable purposes you have attained (entered) the grade of Adeptus Minor1. Furthermore, so long as you do not claim that grade as a result of initiation into a particular group, I see no reason why you should not consider yourself and describe yourself as an Adeptus Minor. Although rarely used, the appropriate title of this grade for a woman is Adepta Minora. It is therefore appropriate that you take, for yourself, an obligation to the Magickal Path. Once you have done this you are an Adeptus Minor, a person prepared to be a Wyzard and Magician.